“The eReader era just arrived, but now it may be ending” declares technology reporter Greg Bensinger in a recent Wall Street Journal article. To support this claim, Bensinger cites two market research studies which show that the eReader boom might have plateaued. Market ‘intelligence’ firm IDC estimates that the sale of dedicated reading devices has dropped from 27.7 million units in 2011 to just 19.9 million units in 2012. Technology analyst IHS iSuppli paints an even grimmer picture, with 2011 eReader sales falling to just 14.9 million units, a 36% decline from the previous year. Just for comparison, IHS iSuppli finds that tablets will have a much sunnier outlook, selling an impressive 340 million units by 2016. After showing us these figures, Bensinger wagers that “one problem [with eReader sales] is that some users who bought eReaders see no particular urgency to buy another.” I am inclined to agree, based on the posts I see by many members of Mobileread, an immensely popular forum site for digital reading enthusiasts. On any given thread, I will read a comment by someone who says that they are still using an eReader that was released three or four years ago. You may love eReaders and be super excited about them today, but if you aren’t upgrading and spending money on new devices, the market doesn’t know this. For example, one member in a news thread about the WSJ article mentions: “Yep, I’ve loved my 505, but it’s pretty much dead at this point. I’ve switched to using my K2 as my primary e-ink reader.” The Sony PRS-505 was released on October 2, 2007, and the Kindle 2 was released on February 23, 2009. Buying a stack of your favorite eReader on eBay might be beneficial to a few sellers who found them in their closets, but I don’t think this stat is making it into market research studies. I see posts like this all the time on Mobileread, and as a lover of eReaders, I can understand why. You find a device that works for you, and you stick with it. I still have my Kindle 3 in my desk drawer, but I also have a Kindle Paperwhite right beside it. If eReader users are unwilling to step one foot on the ‘upgrade treadmill,’ eReader companies will stop making new eReaders. It’s as simple as that. Everyone doesn’t have to rush out and buy the latest Kindle, but there needs to be enough people who do to make the existence of a new generation possible at all. I thought that with the release of the Kindle Paperwhite I could get a lighted cover for my older Kindle Keyboard on eBay for a great price, but even the used covers are still selling for $40-$50 or more. If there’s such a demand for old covers, seems like some people are not upgrading. from $9.99 to $14.99 over the past 2 years. This price inflation can drive one back to the public library or even to reread my own library acquired over the last 40 years. I’ve looking to replace my Kindle DX for a while now. I just purchased Kindle Paperwhite, which is going back next week. Way, way too unpleasant to read on a 6″ screen – it like reading a cheap comic book. I’d be happy to spend the money on a decent e-ink about the size of the iPad Mini, with a front-lit scree. But there is nothing like this on the market. The large screen readers available are generally old-tech, with stylus touch (really?! why?!) and no light. So, my choice is between a cheap, too small 6″ and an overpriced, old-tech 9.7″. Phew! The basic problem with e-Ink readers is that they are very good at doing one thing and not particularly good at doing anything else. Even the PRS-505 and the first generation Kindle made very good readers (I was really sad when I lost my PRS-505 recently, even though it meant I could finally justify getting a Nook). Yes the modern HD, front lit screens are a pretty big step, but unless you read in the dark fairly often, its probably not something you feel you must upgrade for. I suspect that most of the people who wanted to switch to ebook readers have done so. At this point new sales will be driven mostly by replacing broken units and readers given as gifts. The role of tablets also can’t be under-estimated. Many of those who read a lot may want a dedicated reader, but for the person who reads maybe a book a month or less, but who does watch videos, read magazines, etc. a full color tablet makes more sense. When B&N released the Nook Glow I upgraded from my Nook Touch immediately. If they released a new e-reader with enhanced specs (better contrast, better lighting, software enhancements (underlining, ability to “write” on the screen, etc.) I would probably upgrade to that one as well. I think manufacturers need to offer improved models to keep sales up; after all, look at the cell phone market where we all routinely upgrade to get the ever-improving features. Another problem is the disparate ecosystems…I have seriously considered switching to the Kindle Paperwhite but consider switching to Amazon’s ecosystem from B&N’s too much of a hassle/problem since I’ve bought so many in B&N’s. Right… it’s kind of a self-fulfilling prophecy. Like you, I upgraded to the Nook GL from the NST as soon as it was available. It’s an awesome e-reader, but it (like pretty much every other e-ink reader) is crippled by the manufacturer… deliberately. There’s really no reason to not allow more functionality on a simple device. Allow audiobooks (meaning audio output and at least a headphone jack), move to Gingerbread, let go of the glass e-ink screens, make some dedicated e-ink apps to make the device more than just an e-reader. Are people going to complain and say they don’t need that extra functionality? Sure… but here’s the thing… with the exception of the audio/headphone/speaker feature, everything I listed costs the manufacturer virtually NOTHING to implement and it’s all behind the scenes stuff. Don’t want an e-reader that checks email? Then don’t check your email on it. Let the consumer decide, though. Gingerbread would also make the rooting process much more graceful and effective. Believe it or not, manufacturers of devices that are easily hacked (Nook, Kindle, Wii, WiiU, etc) know that they are this easy to hack and recognize that the modding community is a viable and fairly significant portion of their user base. So why not make it easier for that crowd? Especially since it costs virtually nothing. I think the manufactures creating a locked-in infrastructure is hurting sales also. 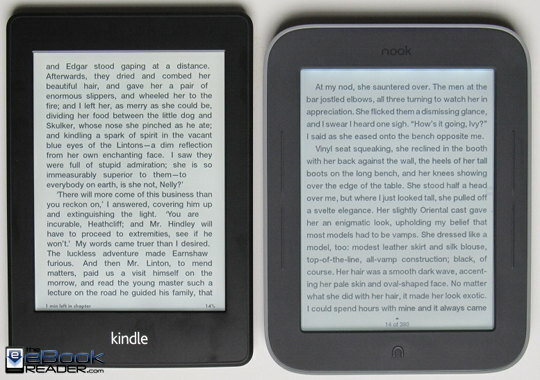 You can’t (easily) switch from Nook to try the new Kindle PW or from Kindle 2 to Nook Glow. So you don’t have a real option or incentive to go try someone else’s latest and greatest device. Also, as a recent post here pointed out, the next generation eInk screens has been available for a couple of years and Amazon just started using it and B&N has yet to announce a device using it. Why would I spent the money to upgrade if there is no real advantage? I can get uneven lighting on my NST with a $3.00 external light. I don’t have to spend $119 to get it. I went back to a eink reader after switching to reader tablets. I started e reading with a PRS505, but I read in the dark about 75% of the time so I bought a NC and then a Kindle Fire (I do not like book lights). However, with the new lighted ereaders I saw value in a device with better battery life, a good screen, lighted screen, and that was lighter than a tablet – so I bought a Kindle Paperwhite. I am also less distracted by not having immediate fast web access and email. Though, it is nice having web access to the Amazon store and for minor searches. Ereaders may be limited by what they do (or do not do) but I think this is exactly why people buy them. I know that is why I bought one again, at least. I’d upgrade, but right now, the device I want does not exist. I can’t find and look at the Kobo Glo locally, I don’t like the blotchy, uneven lighting I saw on a Kindle Paperwhite locally, and I hate the blue glow of the lighted Nook, and it looked unevenly lit to me as well. Sony’s T2 did not bring enough new features to make me want to upgrade. I love my Sony T1 and 350 devices! So I’m kicking back, enjoying my existing readers until something comes along I want to upgrade to. I agree with your statement. The ‘best’ eReaders available today are by no means ideal, but the catch is that if everyone waits around to buy their dream eReader three years from now, that brand might no longer be in existence! I would love to see some survey data on which generation of an eReader people are using. I’d bet that there is a huge percentage of Kindle owners who got a Kindle 2 or a Kindle 3 back during the big eReader boom (2009-2010) and just never upgraded. Amazon, B&N, Sony, and Kobo have failed to improve specifications enough to attract repeat customers. This is why I have been lobbying for HD E Ink screens and faster processors for awhile now. eReaders need to stay in vogue, and to compete with ever increasing tablet sales, they need to make some improvements. Better front lighting, higher quality builds, a next-gen HD E Ink display; all of these things combined would hopefully draw some attention. I agree with the theme of your article. I have an e-reader that works and I have no need at this time to upgrade it. I read a lot, so an e-Ink reader with months of battery life is my best option. I have a Pocketbook 602 which I bought in 2010. It’s still running on its original removable battery, and I think the company has a U.S. distributor who sells replacement 1530 mAh batteries. Not sure of this, as Pocketbook has scaled back from marketing in the U.S. and Western Europe. But I’ll keep using my Pocketbook 602 until it dies beyond repair. My only misgiving with the Pocketbook is its Linux OS which doesn’t allow for the installation of the Kindle app. Amazon has a very large selection of e-books, but just not enough for me to buy a crippled Kindle to read AZW-format books. My E-PUB sources remain Gutenberg, Smashwords, and my public library Overdrive system. I’m also not impressed with the locked-in nature of the Nook Simple Touch, but do think the Nooks have more potential with rooting (a skill I don’t have) than the Kindles. As I move into my final year before retirement, I’m still looking for that one e-Ink reader than can run the Kindle, Nook, and Kobo apps. Any suggestions? I believe a hacked Glowlight Nook Touch could run then all. Since it is Android you should be able to load the eReader apps you mentioned. The Kindle Fire (though not eink) can have all of the main stream ereader apps sideloaded onto them very easily without any hacking. That is one reason I have the KF, I could load my Nook books onto it by simply downloading the Nook Android app onto the KF through the Getjar app store. @steve: Thanks for your suggestion. I’ll start reading up on the Glowlight Nook Touch, especially what it takes to hack it (N2A card or XDA nooter software). Unfortunately, I’m a generation behind learning how to hack, but can certainly give it a try if it’ll make the Glowlight into what I want in an e-reader. I would take a long look at stripping DRM. As it is only possible for books you have bought yourself, I (!) see no moral reason not to do it. It may be illegal, depending where you are living, though. The excellent software calibre is available for Windows, Mac OS and Linux and there are plugins for it available, that strip the DRM as are standalone programs for Windows and Mac OS (not sure about Linux, though). Ask Google for apprentice alf . There are other moral reasons, not to buy at Amazon: they are selling some ebooks (again) with loss, and other bookstores might get killed by that, even the big ones, so bear that in mind. But I must admit, that I look for ebooks in a few stores, and Amazon constantly has both the ebook and the lowest price. Some ebooks are not available elsewhere and some are expensive, except for Amazon. @ingo: I have no issue with stripping DRM, but I don’t have the tech skills to do it. I loaded an Apprentice Alf plug-in into my Calibre program, but couldn’t get the plug-ins to convert any Kindle or Nook books. I have no idea what I did wrong or didn’t do right. Amazon is the cheapest source for e-books, but I can hold off buying them until I can read them on the e-reader of my choice. Thanks for your suggestion about the Apprentice Alf Calibre plug-ins. I’m not upgrading because I’m content with my basic kobo. However, I have taken advantage of sales and bought a new mini (ostensibly for my husband) in case this old Kobo dies. Now my kids are entering the reader market and they are more likely to buy more frequently because their generation seems more jazzed about keeping on top of the newest gadgetry. Well, it’s not necessarily wanting to be on top of technology that drives the purchase of a tablet or tablet/reader in lieu of a dedicated, monochrome, e-ink reader. It’s more about what you’re going to do with it. For people (like my wife) who literally will do nothing more than read books with it, e-ink (even the lower res screens) works great. That said, I’d wager that a fair amount of sales could be made with an e-ink device that had all the major bullets: the ability to read e-books obviously (proprietary format or not won’t matter too much, since conversion is a snap), online capability for downloading purchased books or shopping for new ones, sd card storage for sideloading books easily, audio output (at least through a headphone jack) for text to speech and audio books, a rudimentary but GOOD email app and basic web browser for those times one is in a pinch, solid front light capabilities (like what’s used in the Kobo Glo or that Flexlight technology that never came to be), some basic entertainment apps like the e-ink Kindles have (for occasions you need to just need to kill some time with a game of Sudoku or whatnot), and an OS that can easily be modded or rooted as the owner sees fit. With an underlying Gingerbread infrastructure, a system like this with an e-ink, XGA screen built on the flexible LG plastic technology would hit all the marks and be able to (with rooting) open and read any book from any Android compatible store. Magazines and comics might be a loss to some degree due to the lack of color, but that’s all. For those who don’t want the distractions of all the superfluous (to them anyway) features, the online features (like email and basic web) should be kept tucked into their own sub-menu as to not be broadcast to the reader all the time. Don’t want to be distracted or confused having every e-book reader app installed? Don’t root the device and forget that’s even an option to you. Feel like turning this into a high-res 2.3 Android tablet? Root it, baby and enjoy! Being as the LG screens are cheaper than the glass ones and manufacturers could use the same slow processors and RAM that are already used in the current and last gen e-ink devices (RAM and processors that are MUCH cheaper today, BTW), this reader could EASILY be built for at or under $120 USD retail. Why not do it then? Not enough people whining to have it done… No demand, no supply. “No demand, no supply” is the problem that the market faces right now. Amazon and B&N are comfortable in their walled gardens, so they would never produce a device like you described, and a smaller company doesn’t have the capital needed to get something like that off the drawing board. This is frustrating. Onyx might have a chance if they can improve the quality of their devices a bit and get a few consistent European and US vendors to distribute. I bought my Onyx M92 from an eBay seller based in Georgia, but it doesn’t seem like they are too excited with their decision to carry them, and they certainly aren’t going to order any of the other models like the i62 HD or Firefly. I bet you could count the number of Cybook eReaders in the US right now on one hand. These smaller companies are our only hope for an eReader/Android hybrid. E-Ink screen progress and development, the key and top hardware component for device and quality *reading*, was ridiculous comparing with anything else, from phones, to computers to tablets. And software … we can discuss about, too. Why upgrade so often? There is no such difference between the old and good Vizplex, and mythical readers like PRS-505 and latest generation Pearl screen. And new “HD” screens, still contains something suspicious (maybe need more factory training and improvement, or internal hard & drivers tuning), but… still not making so real difference. And anything else, are external and tricky things, like diferent lighting methods for latest readers. Welcomed, but not part of core technology. Agreed… none of this (the HD screen, apps, email, enhance online functionality) is necessary for the core e-reader experience. In that aspect, the crowd of people looking to get that experience have (mostly) all purchased their choice of e-ink reader… and they’re all good choices, for the most part. That’s where the problem is. Because that core experience was met so completely, there’s no room for improvement. HD really doesn’t matter since 800×600 text looks just about as good as on my 1440×900 Nook HD. RAM, storage, processor speed? not gonna do anything since the older hardware wasn’t taxed, as it was. Color e-ink? We all saw where those projects led. Most people fall into one of two crowds in this situation: the first is the group that wants just a book reader. Problem is, they’re all already perfectly content. The second is the group that wants more… they want what a tablet offers, whether or not it’s tied to a B&N/Amazon ecosystem. That leaves the future of the dedicated e-reader (monochrome ones, anyhow) in a dubious position. There is a third crowd that I fall into that would like to see a US Mirasol reader or a fully featured, HD e-ink reader as I described above. I’d certainly buy one, root the thing out, and have an Android tablet that lasts for days to accomplish basic stuff. But we’re a very small minority that the retail gods will (rightfully) not cater to. That would just be bad business and a money sinkhole waiting to happen. Still, it would be a sweet piece of equipment… now if someone can get Cyanogen running on the NST or Nook GL, we’re JUST about in business (no audio, though). Again, not enough demand to justify developing this, even for the indie enthusiast with no capital to lose… after all, time is money, and wasted time is a wasted effort. Imagine this: a 9.7″ Android OS high-definition E Ink eReader, with a 1.2 Ghz dual-core processor, the same as in the Kindle Fire HD. And why we would need such thing, for *READING* books, text, page turns, and relax and pleasure? Not the common street reader and not at all non-computer related people. The only I agree, I would want a totally free and based Android-OS reader and optimized from factory, and no need to root or doing tricky things (that, anyway, it’s not a problem for me, and for many ones, even it’s more fun). Seems like Onyx this year planning something like this (a new reader, with more RAM, extra processor and Android from factory)… let’s see. – New and well designed e-readers, *including* quality and updated software for many uses and different formats, with screen size 7″ or 8″ fit into current 6″ hardware body – possible. – New screens, (put here size you like and resolution) really “plastic”-based in market, working with no problems for both quality rendering and ghosting, slim readers, and not broken easily (and not, LG or other does not fit, since still have some of these problems, as well as are not widely available in market or in hardware). – New screens, with or without “lighting”, totally like paper-white. More contrast, more background white, more foreground black, no flashing between pages, no delay step for showing text or even graphics (for journals, kids books, dictionaries, encyclopedia…). What would you choose and will better for you, for all of us, and for readers sales and market? Now, it’s like you are using and comparing a 3 or 4 years old tablet screen, resolution, touch quality, speed and processor, software, with actual ones… your don’t even remember first ones, and not even mind to buy. But, you use daily and still buy for E-Ink readers! Right, the average eBook reader might not need all of those extra specs, but students and enterprise users certainly would. There is a whole untapped market of customers who would buy an E Ink device if it offered more capabilities. But I know something like this will most likely not exist in the near future. I want more from ereader, 7/8 inch display with light at least, something like PRS-950. I think, you are wrong, I own a PRS-505 (that is imho 2nd Gen e-ink; 600×800) and a PRS-T1 (imho 3d Gen e-ink, still 600×800). While the resolution is the same, both compared are noticeable different in colour and response time and contrast. While the contrast may not be so significant, the faster refresh of the PRS-T1 is nicer for reading. The screen of the PRS-505 is noticeable darker and also much slower. And that is only the hardware, the reader-software on the T1 (even without rooting it) is better, offering more settings and not displaying page-numbers within the text (cannot describe better). The difference between the T1 and the newer T2 might not be so great to warrant a buying a new Reader as it is nearly the same hardware, even stripped one item: sound, but the other HD-e-Ink-Readers (Kindle Paperwhite etc.) should be faster, as far as the News about them are correct. While there might be subtle differences even between the same Reader-type imho the difference in resolution only not to mention speed and maybe frontlight might be reason enough to buy a new reader with HD-e-ink – but for now not from Sony. I for one am waiting for good reader with a HD-e-Ink and Android, so Kindle is not an option, I am still hoping for the next Sony but may switch. Well, sorry, but I don’t agree at all. I had PRS-505, as well as other 1st and 2st E-Ink readers (someones, still using, working, and upgrading), as well the ones you mention and much more others… and difference and progress is not such noticeable at all. Again, like I explained, keys, consider time and progress. Consider how computers, phones and tablets and their features and screens were released, and consider and compare with actual ones. Now, compare actual E-Ink screens… no way! Even taking actual “HD” ones and tricky light methods (not prefect, with many pros, but also many cons, and probably ready and improved for next-gen readers after actual market and user’s experience). I only read books from the library – and I belong to two different ones to get a good selection. It seems that whenever a new eReader is released, how it interacts with the library is never mentioned. I just upgraded to a Nook Tablet since the screen on my original Nook cracked (my fault). I like being able to adjust fonts, background lighting etc, but the transfer of library books isn’t as smooth. eBook publishers and eReader makers have both failed at creating proper relationships with our public libraries. Publishers hate libraries. Andrew’s proposal is too modest, we all need to buy at least 10 new ereaders to really drive the market. C’mon consumers, consume! Perhaps development of eReaders has reached the point of diminishing returns. Sure, I’d like more font choices, a speedier processor, wireless, and, perhaps, a higher resolution display but several years on my (Sony) PRS650 fulfills its purpose remarkably well. There’s no compelling reason to retire it. But like many here I use the eReader for the one task in which it truly surpasses all other devices: reading extended tracts of text. Its functionality appeals to a niche market of serious readers and I wonder that many of those who initially bought eReaders weren’t more motivated by the novelty of owning the latest gadget. Of all the eReader brands, Sony is one that I could easily see not upgrading for. The PRS-T1 and T2 are basically identical, and the quality of the PRS-350, 650, and 950 eReaders is superb. I got a 950 on eBay this summer and used it as my primary eReader. I agree. True! And specially considering 3rd party development, mods and rooting. Obviously, if you a new users, or need a new reader (well, or enthusiast) you will buy T2, but as for features, screen quality and software … hard to beat these “old” generations. I got a Kobo Glo to upgrade from my Kobo Touch (I read a lot in dim lighting and clip-on lights are a pain to use). I’m extremely pleased with it and was saying to myself that I won’t need another e-reader until this one breaks one day — or I lose it. So I guess I’m part of the problem described in the article. There just isn’t a driving need to upgrade an e-reader once you have the core functionality you want (which includes a built-in front light in my case). Some of the suggestions above are interesting but I note my Glo has a browser as well as Chess, a sketch pad and Sudoku (apparently) and I haven’t bothered to use any of them. My Glo is for reading only. I do like the idea of a page-of-paper screen size e-reader that’s good enough and fast enough to handle PDFs as well as EPUBs, but would I really buy one once I replace my ‘travel’ laptop which would do all that and more? Probably not, so I understand why manufacturers aren’t really pushing ahead with these developments. What WOULD be very cool would be some kind of tablet (or convertible laptop) that features both an LED/LCD screen AND an e-ink screen together (back to back on the tablet presumably, with a firm but easily-removed cover that can be flipped around to protect the screen you’re not currently using). You could use the LCD for gaming and browsing and the e-ink for reading. That would be something I’d be very interested in, but the chances of it being made are probably close to zero. There are several in developing countries who can’t afford eReaders at their current prices. If the price of an eReader drops to $5-$10, then this will open up a huge market for them in these developing countries. However, it will take a long time for this to happen. Amazon has a program that donates large quantities of Kindle 3s to Africa. You can watch a video about this here. txtr made a lot of fuss about developing a £8 eReader, and it had some pretty solid features (5″ 800 x 600 Visiplex display, 8-level grey scale, powered by two standard and replaceable AAA batteries). Unfortunately, it has no OS and doesn’t read ePub or mobi, and you have to buy it as a part of a cellphone contract. The Beagle is really just a document viewer that has to be activated by a cellphone app. I would love to see a $10 eReader hit the market, and maybe txtr will realize the potential for a Beagle II. I don’t see eReaders touching that price here for a long time. However, this low price is possible in developing countries due to local production and large volume of sales. I like evn the surfing on the reader. if they get my goal then I start thinking about upgrading. I’m just waiting for an even lighted screen with back-forward physical turning pages buttons on both sides to buy a new e-reader. I have the NST and am happy with it, being screen quality or physical buttons. I don’t understand that the industry keeps skipping those buttons. Or like with Sony when they choose to place the buttons on the bottom: they are useless when holding an e-reader with one hand (like with Sony) and from the side, which is the most comfortable way to hold a e-reader or a book for me (I hope some designers is scouring this great blog and reading our comments to improve their products). I wonder if any of you is holding their e-reader from the bottom most of the time… As to the other e-reader that has an incorporated light and with physical buttons, the Cybook Odyssey HD by Bookeen, there is only one button per side with one function (only back OR forward from one of the side). These design options don’t make sense to me at all ergonomically. Am I the only one having these needs? I also find that Nook’s single tap to turn pages much more easy to use with one hand (but a swipe will work too for both sides in both directions) than Sony’s swipe only system. I think it’s important to point these simple basic features out because at the end of the day, besides openness of the ecosystem for supported e-book format, these are the only points that matter to me. Therefore, I have to conclude that my only hope is that Nook will come up with a better lighting system than the one currently offered because the design of their e-reader is really what fits me most. I agree, too! Totally! About the buttons! Never understood that about designers, quality and engineering departments and related. As for me, all of them will go out — never user really a device to read and many hours. This is also majoe fail, IMHO, for new Kindles, being perfect previously. I’m waiting also anxiously new Nook generation, specially if easy to root again for Android. However, there is one having such things – but hard to find in USA, and even not to easy in Europe – it’s the Onyx HD (no light) and Firefly (light). However, their software and firmware is far from perfect — maybe if they finally managed to get out someday the promised Android-based alternative OS, then using 3rd party programs and Android ones would be interesting. Or wait sometimes along the year and, hopefully, they can even released the rumored new E-Ink device using Android from factory, with more RAM, processor and so on. Thanks jotas for pointing out the Firefly. I read some reviews and the verdict for the front light leaves a lot to be desired. I really would like a Nook for another reason: the cover. I’ve not found one I like more than the easel style they have (it’s very light too). The cover is something not to overlook price wise when opting to shell out for a new e-reader because its cost is a consequential portion of the value of the reader itself… And to the best of my knowledge, only Nook offers the easel cover format. I have an easel style cover for my Sony 650 that I love called Tuff Luv. Even has slots for holding extra SD cards. I just got a Nook HD and have rooted to Jellybean but plan to continue using my Sony for most of my reading. I much prefer e-ink over backlit screen, but this way when my Sony dies I’ll at least have something to read on for awhile. Wow, great discussion! To be perfectly honest, it’s not the responsibility of current e-reader owners to buy the latest and greatest every 6-12 months. For some reason the major sellers in the US trickle out their upgrades rather than giving us a super-great package. Much of the world is in a horrible recession but businesses don’t seem to be adjusting their sales predictions. It’s not really in the best interest of most middle class people to buy the latest electronic toys every year: desktop computer, smart phone, e-reader, tablet, laptop. Maybe the top 2% who just got that terrific tax break need to buy more e-readers! I bought a GlowNook(tm lol) last summer and am loving it, uneven lighting and all. The lighting is still better than even the m-Edge book light which is pretty good. Most books for the Nook are purchased in e-pub format which means B&N is my last choice for books. Proprietary bs drives me nuts lol. The PRS-650 is a fab little reader, but I’m just too hooked on the GlowNook to use it often since lots of my reading is done in low light conditions. After using e-readers for most of my reading for the last 3 or 4 years, I’m not going back to paper and am slowly divesting myself of my huge paper book collection. How about an exchange program from the publishers; I turn in my paper book and you give me the e-pub version. Yeah, I like that idea! The GirlGeek got a beautiful Nexus 10 for Christmas and just about blew out her eyes reading on it. 5 hour reading marathons are much easier on these old eyes done on an e-ink screen. The pretty color tablet is just so dang much fun to use! Great for checking e-mail, surfing the web, playing “The Bard’s Tale”, and shopping too! Even watching Netflix while hubs hogs the TV! I am a Sony PRS950 owner. I love my Sony reader and it still does the job, but I would upgrade immediately if Sony sold a modernized PRS 950 with aluminum casing, glowlight, a stronger 1GHz processor, 8 GB internal mem., high res 7″ screen, longer battery life and user replaceable batteries, support for more formats (MOBI), Internal silo for the stylus and updated software. Sony dropped the ball in a big way. They don’t even make 7″readers anymore and replaced beautiful aluminum with cheap looking plastic. They removed audio, they removed the internal storage for the stylus, they don’t feature high res screens, have no glowlight etc. I consider my PRS950 still to be the best looking reader I’ve seen and am willing to pay for a modernized version of it. Sony should not try to compete on price and downgrade its product, but should create a beautiful and feature rich luxury product. I do not want to replace my reader every year. I think it is preposterous and wasteful to do so. My reader is my friend. It carries my books and I want to keep it with me for at least 4 years at a time. See how much ideas for new e-readers and people improve … incredibly! Planned new e-reader, powerful, open Android … and, again, two or more years back for design! Feature sets in the new e-ink readers are all fine and good, but they’re all coming to the same plateau, from a technical standpoint. Really, they all run about the same speed, new readers are generally utilizing an XGA display (and if there is a next Nook e-ink device, I suspect that it will, as well), and everyone is offering a frontlight of some sort, for better or worse. Here’s what I see happening in the near future… B&N and Amazon are going to stick to their guns and stay within their own ecosystems. Kobo will continue not being in any ecosystem and will continue to be able to read virtually any e-format (non-DRM, of course). Lights across the board will get a lot better, with less screen bleed. Contrast will improve somewhat on all devices. And if Kobo plays this correctly, they could have something big on their hands. If, like the Arc, this next device is based on Android (2.3, presumably) and supports Google Play out of the box with a very cutomized overlay, this e-ink reader becomes a threat on multiple levels. E-ink battery life? Yep. Front light with even lighting? Got it. High res plastic screen that won’t shatter? Sure. Kobo store (and all the international store support that it comes with)? Duh. Micro SD expandability? Yup. The ability to install Nook, Kindle, Play Books, Aldiko, etc. apps and have DIRECT access to their DRM formats (as applicable) without needing to convert via Calibre or the like? That’s the nail in the other readers’ coffins… convenience. So long as the next Kobo keeps pretty much the same form factor on top of all of that, and maybe add some soft texturing to the back for an improved grip (get rid of that quilt design… nobody cares), they’ve got the total package deal. Maybe add physical navigation buttons, too (really dig those on the NST). I love B&N readers, but I’d definitely trade out to have a device that A) isn’t locked into an ecosystem, per se, and B) supports all of the other closed-garden ecosystems out there, right out of the box.